Yes, it's Olympics time and I am watching like the rest of the World! 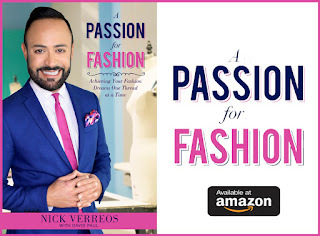 The UBER fit bodies, the muscles, the amazing athleticism, the DRAMA...and more importantly, for me, the FASHION! Weeks ago, I wrote about the Opening Ceremonies and my "Best & Not-So-Good" ensembles/uniforms that were featured during the London 2012 "Parade of Nations". After watching the great Olympics Gymnastics competition and especially, seeing the "Fab Five" USA team win the Gold, well, this spurred me to discuss Gymnastics Fashion Through the Years. Congrats to the Fab five and their Gold! I was almost hyperventilatin' and "clutching my pearls" when they won!! (Yeayyy Girls!) But then, it was such a let-down of an Olympics Fashion Moment (and I sure as heck TWEETED about it back when it happened), when I saw their Medal Podium SAD DEPRESSING gray oversized Nike zip-up HOODED rubberized zip up Jackets. I guess, that this is what the USA Olympic Committee (unwisely) chose as the garb for all their podium medalists to wear. Whoever did that A.) Must have been Straight and not realized that a Medal Ceremony requires, well, a little more "Razzle dazzle"! and B.) Not realized the immensity of "THE PICTURE that will go around the World" . I'm not expecting bedazzled red Liberace capes but these gray parkas are what people wear as they're about to go shark-watching...or what someone throws on for an early morning run...in the middle of WINTER. Rubberized? Hooded? For the Summer Olympics? #FashionFail. 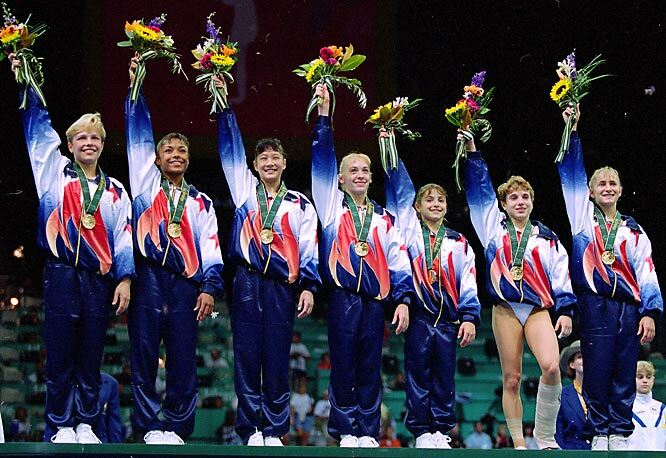 The Magnificent Seven: 1996 Olympics US Women's Team--So, then after my Fashion Disappointment in those medal podium USA sad depressing zip ups, I thought "well, let me see what the Gold-medal winning USA Gymnastics Magnificent Seven wore back in the 1996 Summer Olympics". And as you can see, it was MUCH BETTER than the 2012 Nike Parkas. They wore very 90's track suits but "glammed-up": The bold red, white and blue colors, the design "hints" of the Olympic Torch emblazoned on the track jackets. At least it was visually interesting. If Twitter was available then, I am sure this would NOT be a #FashionFail but #FashionFab. 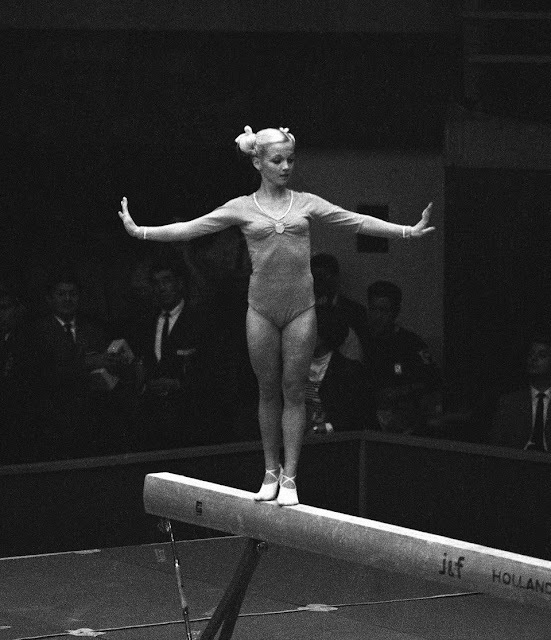 Pink Queen: Cathy Rigby at the 1968 Olympics--Rigby was the highest scoring American Gymnast at those games. In those days Americans were not considered a threat in Gymnastics. But adorable Cathy Rigby with her pigtails and pink leotard was the the gymnast that made young girls across the country begin to take interest in gymnastics. 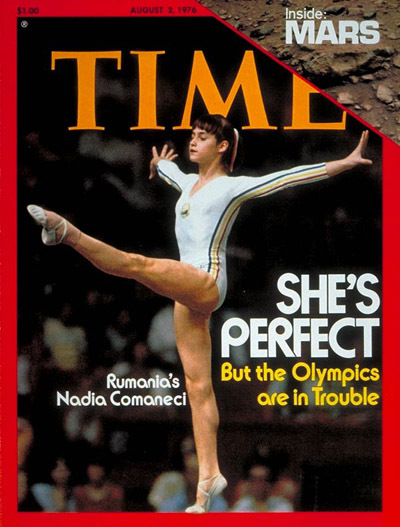 Nadia Comăneci: Nadia is probably the most famous gymnast of all time. She is a Romanian gymnast, winner of three Olympic gold medals at the 1976 Summer Olympics in Montreal and the first female gymnast to be awarded a perfect score of 10 in an Olympic gymnastic event. 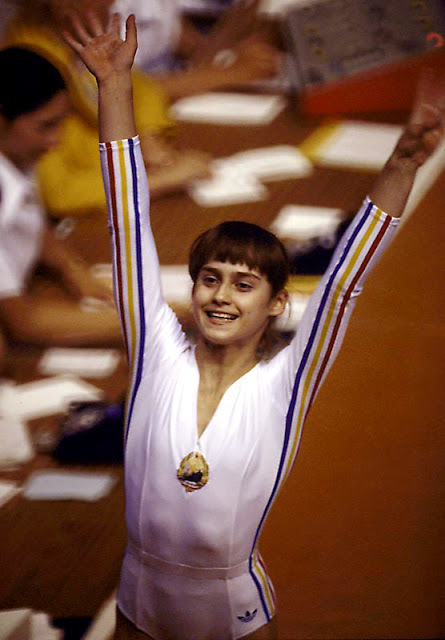 She is also the winner of two gold medals at the 1980 Summer Olympics in Moscow.I will age myself but...yes, I TOTALLY remember seeing her perfect performance back in the day! Her Adidas leotard at the '76 Montreal Olympics followed the "Olga Korbut White" trend of the time in terms of Gymnastics-wear. Hers, though, also had the Romanian flag colors added to the side seams and underseams of her sleeves as well as princess seams to add extra fit detail. It was clean and patriotic in terms of representing her country and looks quite chic and modern. 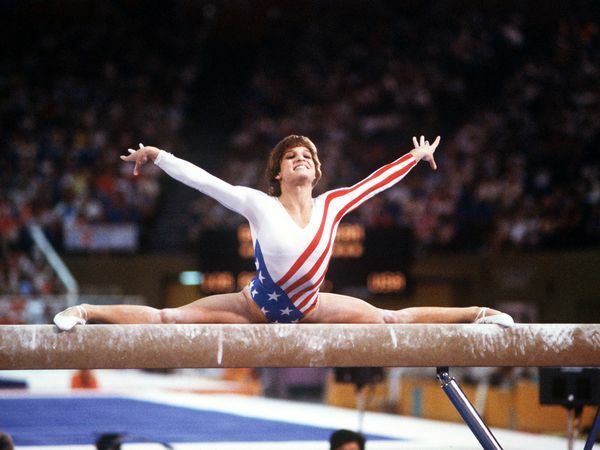 Betsy Ross Would Be Proud: Mary Lou Retton-- was the first American (and actually the first gymnast NOT from Eastern Europe) to win a Gold Medal in the All-Around Event at an Olympics. There is always debate about her gold since the Soviet Bloc nations (except for Romania) boycotted the games in Los Angeles, but a win is a win and Mary Lou actually received 5 Medals at the 1984 Games. Her leotard was ALL THINGS PATRIOTIC which became a widely-used Gymnastics Fashion Trend at the time, especially at such a high-profile event as The Olympics. There was no denying where Miss Mary Lou was from kids. 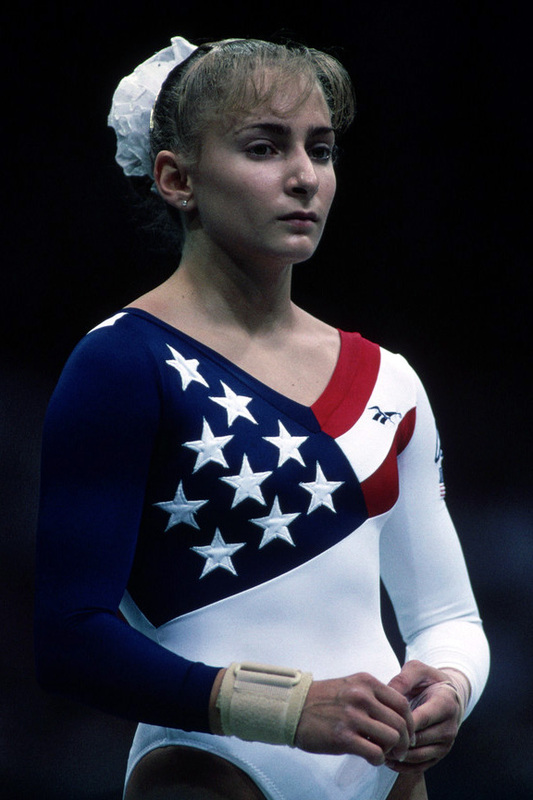 Patriotic: Shannon Miller--Miller competed in the 1992 Olympics in Barcelona and the 1996 Olympics in Atlanta and was part of the "Magnificent Seven". She has often been an overlooked gymnast, but she has actually won 7 Olympic Medals! Hello. 2 Gold medals at the 1996 Games and 5 medals at the Barcelona Games.The "Patriotic Gymnastics Wear Trend" is perfectly visible in her Olympics leotard here. What's more fun is, of course, her SCRUNCHIE! Everyone thinks of this hair accessory as SOOO 80's but yes kids, this unfortunate hair accessory trend continued onto the 90's. And can we discuss her DRY hair bangs? I excuse her for not having a de-frizzer serum at the time. I think she had more important things to worry about. Red-and-White: Dominique Dawes--Dawes was actually a member of 3...yes 3 Olympic Gymnastics Teams! She participated in the 1992, 1996 and 2000 Games. She was also a member of the Magnificent Seven Team and has won 4 Olympic Medals (1 Gold and 3 Bronze). She was Gabby Douglas before Gabby Douglas was even born! I LOVE this red leotard above. It's "Patriotic" but not in a "that's the US Flag" sort of way. No Pants Kerri Strug--Strug is probably the most memorable member of the "Magnificent Seven" team. Who could ever forget that vault and her being carried to the medal podium by Bela Karolyi?! Her best accessory was her bandaged leg, but all she could think about was standing on the podium with no pants! No worries Kerri, you looked stylish with or without pants, those things were too loose and bulky anyway--even for the 90's! Crystal Beginning: Carly Patterson was the Gold All-Around Medalist at the 2004 Athens Olympics. She won 3 Olympic Medals. The 2000's signaled the beginning of "Oh Wait, Are Those Sequins??" in terms of Gymnastics Leotard Olympics Fashion. Diamantes and heat-applied crystals were big during this time and can be seen in Patterson's lipstick red leotard featuring a see-through stretch chiffon neckline. Barbie Olympics: Nastia Liukin--Liukin was the All Around Gold Medalist at the 2008 Beijing Olympics. She won 5 total medals at the games: wow! And I also say "wow" to her bubblegum "Barbie pink" v-neck leotard with heat-pressed crystals. Adidas was smart in designing and creating a leotard in a BRIGHT BOLD COLOR and (for a change) one that wasn't so "I am wearing the USA flag!". She looked soooo cute! Barbie Doll Cute! Gabby Douglas was the 3rd American Woman in a row to win the Gold Medal in the All Around Event. And although she wasn't as successful in her individual events, she is the only American woman to win a Gold Medal in the Team Final as well as a Gold Medal in the All Around. Gabby wore a Deep Fuchsia-violet colored iridescent Lycra leotard with (gasp!) a scoop neck (as opposed to the widely used by Gymnasts v-neck). And yes, there were crystals. There was NOTHING "Go USA!" about her leotard. I'm sure some of you out there might criticize her for that but, I think she looked Fashion Fab in this. Iridescent Blue-Violet Princesses: "Team USA" gymnasts Gabby Douglas and Jordan Wieber during the qualifying round at the 2012 London Olympics. 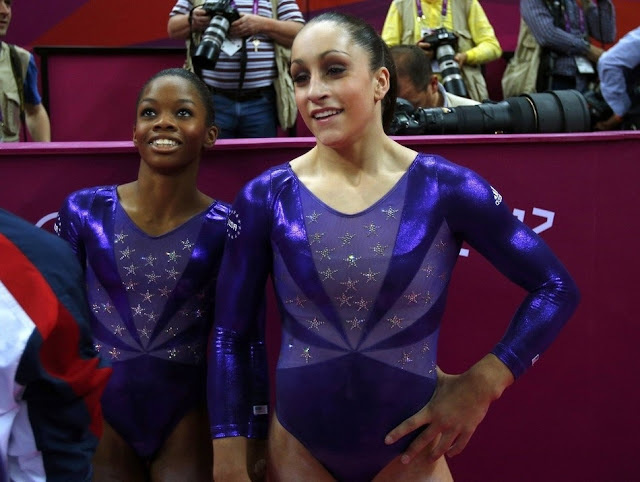 For the Qualifying Rounds, the USA team wore these violet-blue iridescent leotards with crystal stars and a modified v-neck. 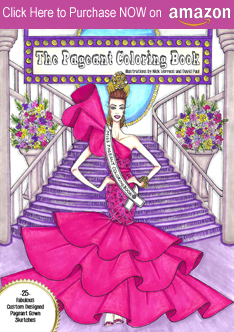 They were a tad "Toddlers and Tiaras" and a bit of an 80's throw-back. But they still worked for me. The while point is to stand out, get noticed and give a "nod" to where they are from. So...good job. Red Sequin Gold: The Fab Five in their Gold Medal winning leotards above, as they find out the results. These are the leotards they wore for their Team Competition. I loved these; they were bold in color and had the "bling-bling" of the silver crystals placed in a way to highlight their magnificent and well-trained upper torsos. This was probably the most Swarovski Crystals we've ever seen on a leotard and I love it! 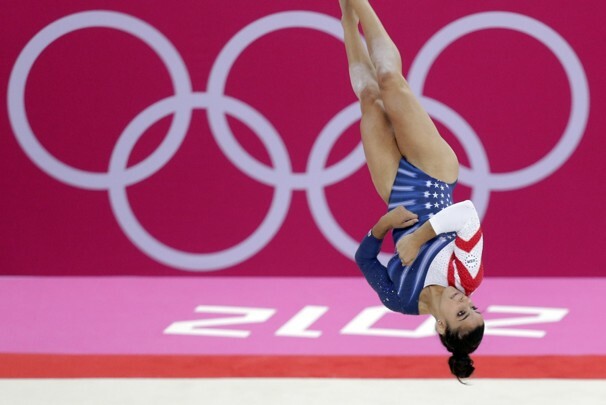 Stars and Stripes Final: Aly Raisman ended up being the most decorated American Gymnast at the 2012 London Olympics winning a Gold Medal in the Team Competition, a Gold Medal in the Floor Exercise and a Bronze on the Balance Beam. Here she is--going "Retro"-- wearing the very patriotic leotard during her Gold Medal winning Floor Exercise. The crystals add enough of a perfect sparkle to put a punctuation mark on her fabulous performances! 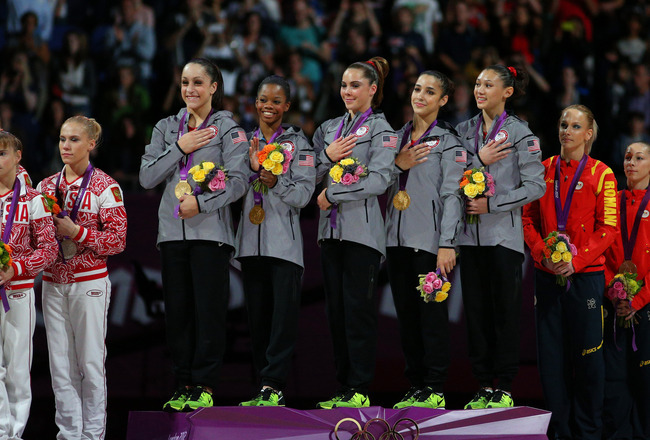 Click HERE to read a great interview with the makers of the now infamous US 2012 Olympic leotards. 0 Response to "OLYMPIC STYLE.....London 2012 Olympics Fashion, Gymnastics Fashion Through The Years"